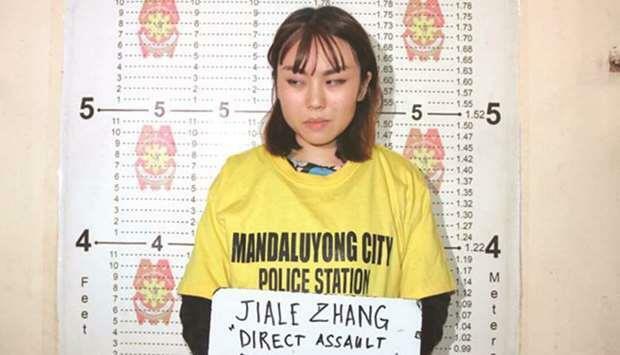 (MENAFN - Gulf Times) The Philippine National Police (PNP) yesterday awarded the police officer who incurred the wrath of a Chinese student who was refused entry at the MRT for carrying a cup of taho (soy dessert). Police Officer 1 William Cristobal was awarded the 'Medalya ng Papuri in Camp Crame for his 'one commendable act that is worthy of emulation by other PNP officers. He was lauded for his 'professionalism and patience after Jiale Zhang threw the cup of taho at him at the MRT station in Boni Avenue. 'I am not expecting this recognition because I only did what the Chief PNP (Director General Oscar Albayalde) expect of us: be patient and do the right thing, Cristobal told reporters in Filipino. 'They have to obey the law here…They have to respect our culture the way we respect their culture and laws of their land, he said. Meanwhile, Senator Richard Gordon and senatorial candidate Christopher Lawrence 'Bong Go yesterday joined calls for the immediate deportation of Zhang. Gordon, chairman of the Senate Justice and Human Rights Committee, said the Bureau of Immigration should immediately start deportation proceedings against the 23-year-old for her failure to respect the country's rules and laws. 'The Chinese nationals here and all other foreign nationals staying in our country should respect our rules and laws. China, as our nearest neighbour in Asia, should advise its nationals about complying with the rules and laws of our country and respecting persons in authority here, Gordon said. Go, who was in Camp Crame as the guest speaker during the launch of 'Kabataan Kontra sa Droga at Terorismo programme, said Zhang 'has no respect. '(We) Filipinos give the highest respect to the police…We need to show respect so that others will see how to respect other people, the former top aide of President Rodrigo Duterte said.